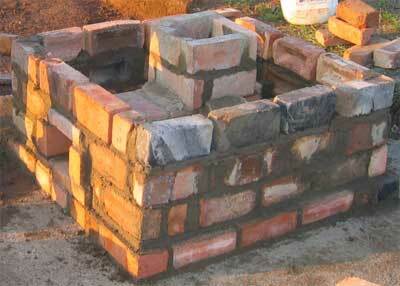 This is the Libhubesi Stove. It is designed for large pots serving 50 to 100 people. It will be constructed by semi-skilled to unskilled labourers in remote areas of Swaziland . Libhubesi means "The Lion". It is so named because we are going to use the anatomy of a lion to do the training work. If you look carefully at the bricks and their relative positons, you can see the paws, forearms, elbows, the shoulders, back and head etc. This way we can train people who cannot read a tape measure or follow drawings to build the stove accurately and to remember the unusual construction sequence. The bricks are standard 220 x 106 x 76mm, shown in blue. The pavers are 220 x 106 x 51mm and are shown in brown. They a produced at a conventional kaolin brickyard and would be considered of high quality, fired at 970 C. The stoves will be built from rejected bricks (cracked, bent and over-fired) as well as 'fickets' which are under-fired bricks with better thermal properties. The fire is in the belly of the Lion. Its body holds the fuel. The air enters the lion's mouth and the pot sits on its head. The lion is enclosed in a 'cage' of bricks. It breathes through 12 narrow slots under the thin cement slab created by leaving out the mortar between the ends of the bricks in the top (4th) row. 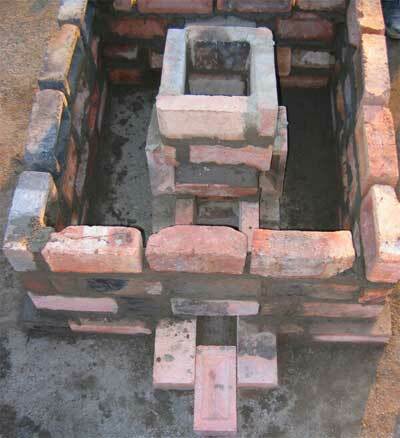 The fuel feed and combustion is that of a Rocket Stove, however it incorporates feeding pre-heated air into the combustion chamber from the back, and a robust construction at the back of the chamber to resist the impact of wood being hurled against it. One photo shows the fuel feed hole and the other shows the air entrance and the ash clean-out hole. The brick in the centre serves as a door to shut off the air so cold air does not enter the combustion chamber. If the brick gets lost it can easily be replaced. When pushed in, it hits a metal stop lodged in the brickwork. The attached animation shows the construction to the level of the thin slab. The upper section is the part that holds the pot. The details of that will follow.